It's true, we'll admit it, we've been putting off reviewing Walking Disaster. Why? I know a lot of people will disagree but well we were a bit disappointed. We all loved Beautiful Disaster and so were looking forward to reading it from Travis' point of view. As we waited so long and the book was obviously already mapped out from Beautiful Disaster, we had hoped for new scenes and insights into Travis and what he did when he was apart from Pidge. Unfortunately it seemed there were hardly any new scenes. Ok so we still got Travis' POV on scenes we all know, but actually we felt he wasn't the Travis we all know. We felt it didn't have the passion we expected from him, he seemed a different person and that was a big disappointment. For a book we thought that we wouldn't be able to put down, it was surprisingly easy to. Willow found that at times she was getting bored and Dawn questioned whether this was because we knew most of what was going to happen, but that wasn't it. 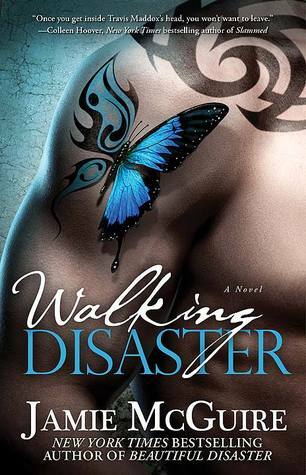 Maybe it's because we had waited so long, the book had so much hype and Beautiful Disaster was such a good book, that we had higher than high expectations but in the words of Donna "I've never felt so let down from a sequel"
Beautiful Disaster is a must read, but we hate to say it, this one just isn't as good.